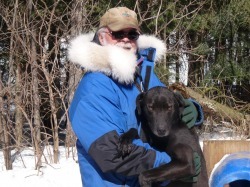 "Lilly's First Real Test At Lead In The Northern Forest!" This is the time of year were we play with the dogs and try them up at Lead. This was the first time Lilly got a real opportunity to run Lead for over two miles. Lilly has a real outgoing personality and strong desire to be independent. She is a natural leader in the kennel and now proving the same in a team. She was not fazed at all at being at Lead in a 13, Dog Team. She is A Natural Leader! Lilly in the kennel, receiving pets, getting harnessed (also un-harnessed) and running is alway very animated and enthusiastic. She will be fun to see develop next season! On Sunday, both Suzanne and Michele said farewell to Miortuk Kennel and were off to continue their adventures here in Quebec with a visit to Montreal and Quebec City before departing to home. On Thursday, we had a visit to a Cabine A Sucre for our annual celebration of the arrival of Spring and Miortuk's way of saying thank you for a great season by this years helpers. Now, the kennel gets into its wined down mode for the Summer and to prepare for next Fall to start the training routine all over again. Just a reminder there is still an opening for a Handler/Trainee for next season. Now it is time for me to be with just myself, my canine family and the forest.